Diary of an Aspiring Loser: Where's the Pool? I am really into tracking things. I like tracking my heart rate, my weights lifted, my distance hiked/biked, all of it. That's why I know a Garmin Edge 305 is in my future. But this isn't about that. 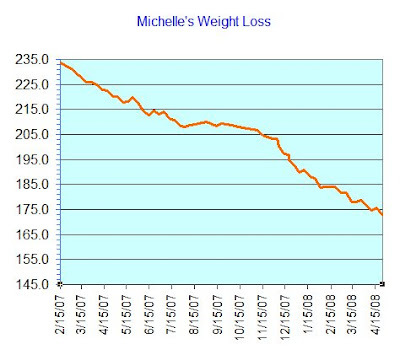 I have been meaning to plot my weight loss on a grid to get a graph for a while but haven't gotten around to it. Kristy read my mind, something we have a habit of doing, and made one for me. Wow. Wouldja look at that? My brain has a way to go to catch up with my body so visuals like this are very helpful. Thanks Kristy! I counted and there are 9 rows. I just entered row 7. My brain better hurry up before I get to goal weight. Funny thing about goal weight, it's becoming less and less meaningful. I think of it more in terms of fitness and how things will be easier when I'm carrying 30 less pounds than I am now. It's not so much about the number anymore. Who is this person typing right now? Anyway, a few weeks ago I read about this book on someone's blog and purchased it. 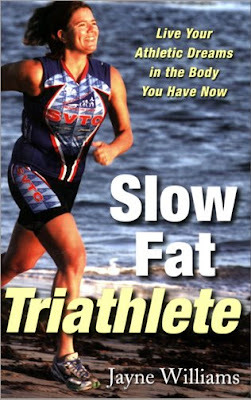 It's called Slow Fat Triathlete . Needless to say I can really relate to that title. The more I read the more Jayne convinces me I can do a triathlon. Have I lost my mind? Well, if I have indeed lost it, maybe I'll find it on the triathlon course because I just registered for a triathlon!!! It happened when I started browsing through events on Active.com looking for a 5k. Needless to say I found a few of those but I'll tell you about that in a minute. I stumbled upon an event called Tri for Fun in Pleasanton on June 21st. They describe the event as "designed for novices". The course is a 400 yard swim, an 11 mile bike distance and a 3.1 mile run. Can I do this? Well, Jayne (and some of my friends who have been telling me I'm in better shape than I realize) have convinced me I can. I signed up Miguel too because having him by my side will make it all the more fun. I called and told him and he's very excited, "That'll be fun!" Yes it will...I hope. I did go to the site to find some 5k events though, which I did. Originally when I started the Couch to 5k running plan I picked the 5k at the SF Marathon in August as my goal run. Well a rafting trip to which a friend invited us conflicted so I had to find a new run. I found a couple. I signed up for the Marina Green 5k on July 20th and the Golden Gate Park Cross Country 5k on August 17th (with my friend Reina!!). You might have noticed that both of those are after the Triathlon. I guess I just inadvertently moved up my 5k goal to the date of the triathlon, June 21st. I signed up for three events from the comfy-ness of my couch. This is too easy. I need to stop. A triathlon? Holy Goat Cheese! I woke up this morning with an inkling to find a pool in my neighborhood in which to swim some laps. Guess I better find it. Oh girl, you can soooo do a triathlon. You run and bike already. 400 m swim is nothing, less then 10 minutes. Piece of cake. Oh, how exciting - a new triathlete!!!! You continue to amaze me, Michelle! There is no stopping you now! Maintain???? I don't think that's going to be a problem ever again. You're having waaaaayyy to much fun. That book looks great. I think I'll get it. That is some seriously inspiring progress there!! WOW I'm very impressed. Will need to spend some time reading around your blog, I just found it. That is so cool! That book looks like it is right up my alley, so I will have to check it out. Not that I am thinking about triathalons now... I've got marathon fever, heh! Good for you. You've come such a long way.